On my Lenovo Thinkpad T460 the key combination Alt + F2 does not work. Does anyone know how to fix it? It should start the Run Application window. 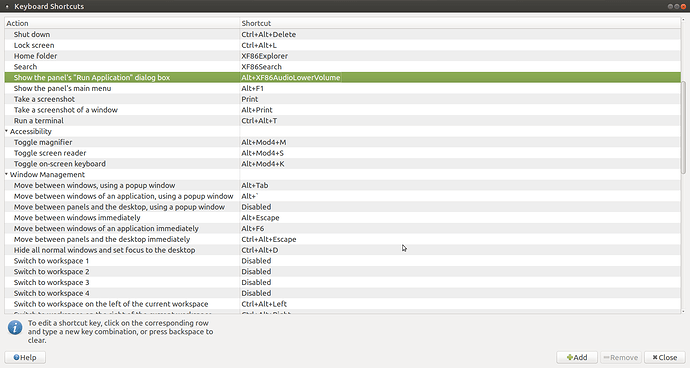 Thanks, the command starts the run-dialog. Strangely, in Control Center > Keyboard Shortcuts I can see Alt + F2, so it should actually have worked out of the box. When trying to assign a new shortcut by pressing Alt + F2 it shows this instead: Alt + XF86AudioLowerVolume. Isn’t this key supposed to be my F2 key? At least it is labeled with both F2 and a volume control symbol. Wath is your laptop/PC model ? Is your keyboard generic or does it have additional keys ? (Not talking about the FN key combinations) . There must be something wrong in the kbd layout of your installation . I have a new Lenovo Thinkpad T460. Notebookcheck has recently reviewed it and here is a picture of the actual keyboard layout. Is it a generic keyboard? I am not familiar with this term. Can you tell me wath does mate settings tell me about the model ? To check it go to Control Center / Keyboard / Layout and the you should see Keyboard Model . 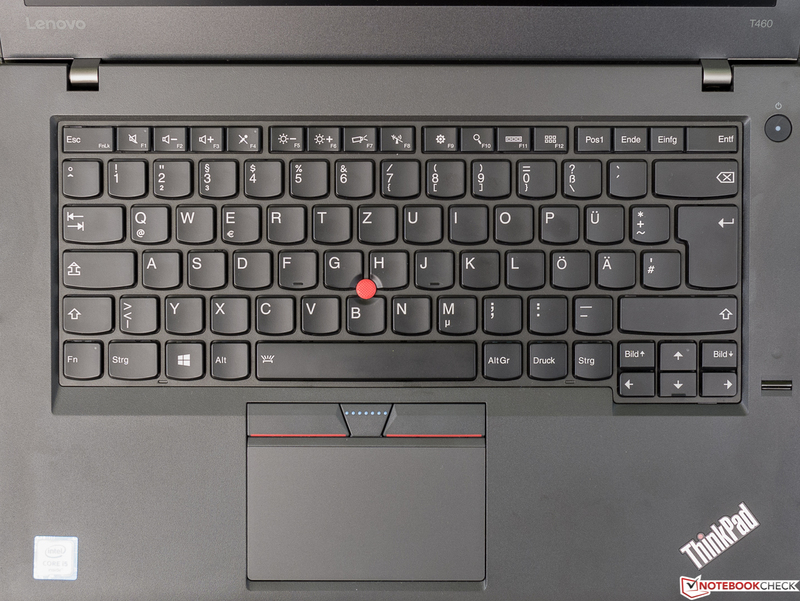 If it is on Generic keyboard 105 keys then Try to select lenovo and then try other simular thinkpad models . This has happened to me on my previous Laptop . This happens when the system didn’t set proper keyboard layout the first time u installed the system . 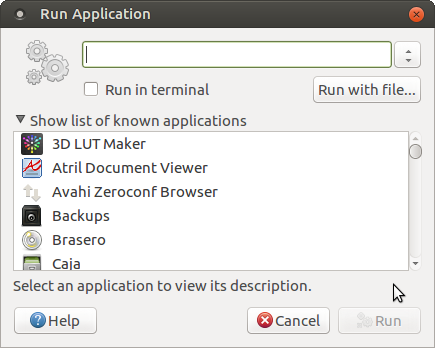 You can test it by binding the run dialog . The right is when you see alt+f2 . I only see these models when I choose Lenovo from vendors. The default keyboard model according to the Keyboard Preferences is: Generic 105-key (Intl) PC. Righ click layout indicator in the panel and select show current keyboard layout and start pushing the keys . If the button in the app lights up according to the button you clicked it should be OK. I changed it to IBM ThinkPad R60/T60/R61/T61 model but in the keyboard settings it still says the same thing: Alt + XF86AudioLowerVolume. Maybe this is just a terminology issue? In both cases (with the generic keyboard and the other option you suggested) I can press Alt + F2 and it launches the Run Application window but only after I have manually set it to Alt + XF86AudioLowerVolume. It seems there is no option for me to set it back to its default generic keyboard? I don’t notice any difference between this and the generic model. Clicking the Reset to Default button still keeps the IBM ThinkPad R60/T60/R61/T61 model activated instead of going back to Generic 105-key (Intl) PC. With both options, most of the F-keys don’t work. Do you know if there are any keyboard configuration files that I can import to update the available models in the keyboard settings? It certainly would be great if they other keys are working as intended to. Try to bind it with ALT+FN+F2 and if it binds to ALT+F2 , I am a complete ■■■■■■ . There should be a option in BIOS witch lets you switch fn emulation mode . Some laptops have a function to use the hotkeys withought fn emulation . That reverts the FN so you have to press FN+F2 to actualy use F2 and just F2 to acces the multimedia or extra keys . The XF86 refers to those media keys . This is it! Thanks so much. I have to press Fn + Alt + F2 to start the Run Application box and this also displays it correctly as Alt + F2 in the Keyboard Shortcuts. Some laptops have a function to use the hotkeys withought fn emulation . That reverts the FN so you have to press FN+F2 to actualy use F2 and just F2 to acces the multimedia or extra keys . The XF86 refers to those media keys . As the manufacturor choose generic and there you will find it . The reset buttons resets the layouts not the model . Thanks a lot, all is working well now.